ChiME works with Chicago-area schools, organizations and community groups with special needs populations to provide Music Therapy within the classroom setting. Designed for children aged three years and up, the curriculum for children with special needs addresses specific non-musical goals in a fun, motivating group music environment. Songs, instrument play, and movement games provide the motivation and framework for children to develop and practice functional skills that will assist them in their everyday life. Sessions are led by Teaching Artists and board certified Music Therapists trained to use the curricula in a manner that will assist students in improving cognitive, motor, communication and social skills. 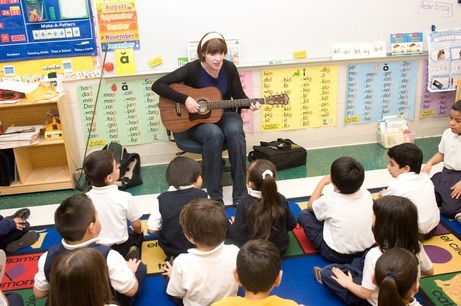 Teaching Artists and Music Therapists collaborate directly with the classroom teacher and participating therapists to provide appropriate instruction to engage and challenge students. ChiME’s Music Therapy program encompasses Group and individual Music Therapy services. Group Music Therapy sessions will provide an atmosphere in which children can grow to their potential through activities of play, music, and positive social interactions— all designed to optimize their success. Students will be able to explore their own abilities, strengths, and relationships with peers in a fun, motivating, and non-threatening environment. Each child’s Individualized Education Plan (IEP), as well as assessment and observation by the Music Therapist during the first several sessions, will serve as a baseline for measurable goals and objectives to be targeted during Music Therapy. Goals suitable to Music Therapy will be selected from the child’s current IEP, and all data will be shared with the therapy team at regular intervals. A summary of data and the student’s progress will be available when needed, especially during IEP reviews and team goal writing. Music Therapy sessions are available for groups of children 3-7 years old. Sessions Groups are 30 or 45 minutes in length, with the ideal number of students ranging from two to six children per group. Groups will meet once a week, and activities will be written to address the goals and objectives selected from the IEP. Group Music Therapy will heavily stress social interaction between similar-aged peers. Individual Music Therapy sessions are an extension of group sessions and provide more individualized and deeper therapy experience to children with special needs who respond especially well to music. The child’s IEP, as well as assessment and observation by the Music Therapist during the first several sessions, will serve as a baseline for measurable goals and objectives to be targeted during Music Therapy. Goals suitable to Music Therapy will be selected from the child’s current IEP, and all data will be shared with the therapy team at regular intervals. A summary of data and the student’s progress will be available when needed, most especially during IEP reviews and team goal writing. Individual sessions range in length per child from 30 to 45 minutes. The Music Therapist and child will meet once a week, and activities will be written to address the goals and objectives selected from the IEP. These goals might range in participation level from a basic goal, such as turning one’s head toward the direction of sound, to a very advanced goal, such as addressing academic concepts like math.